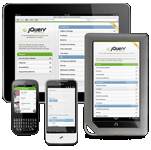 Currently in production, Mobility is a theme specificallty targeted for mobile devices utilizing jQuery Mobile. Using mobile device detection, Mobility can be automatically displayed to mobile users, while all other visitors will view your standard "desktop" theme. Look for a Mobility beta sometime late 2012 to early 2013. and we'll keep you informed with updates along the way. In preparation for the upcoming release of our style switching theme Chameleon, we would like to give a quick overview of how alternate stylesheets work; so that others can modify, customize, and build upon the Chameleon framework. CSS stylesheets can relate to your document in several different ways; but for now let's concern ourselves with persistent and alternate stylesheets. Persistent stylesheets are your normal, everyday stylesheets that are always enabled. They are defined by setting the rel attribute to “StyleSheet” and have NO title attribute.